Cottages are almost always idyllic. There are popular tourist places that now have plenty of cottages, not to forget the hotels, resorts and vacation rentals. That has adversely affected the serenity of many paradises across Canada. However, retreating to a cottage for a few days can be a replenishing experience and if a pristine landscape with a lovely cottage is what you call home then your day-to-day life can be one perpetual holiday. A special asset like a cottage needs to be treated in the most apt ways. It should have the ideal installations, be it the plumbing or the electrical fixtures, the flooring or the home appliances, the recreational amenities or the immediate surroundings. 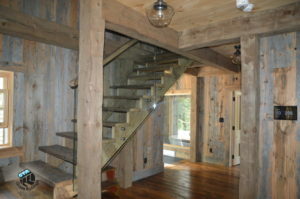 A cottage must have stainless steel and glass railings. Traditionally, cottages have had wooden railings. Iron or metallic railings were also not uncommon. The combination of wood and metal has also been prevalent in some regions. There is no dispute that wood makes for a nice deck, it is great as stairs and is in fact one of the integral building blocks of most cottages. That doesn’t take away from the utility, durability and affordability of stainless steel and glass railings. Check out some state of the art cottages online and you would find spectacularly satiating stainless steel and glass railings. It shouldn’t be a surprise for anyone really. It is obvious why glass and stainless steel railings look splendid on cottages. Stainless steel is durable, sleek but sturdy, affordable and easy to maintain. It can come in a myriad of designs so you don’t have to adhere to conventional architectural norms or limited possibilities as dictated by the malleability and tensile strength of the material. Stainless steel is chic but also practical. It serves as the perfect material for the framework wherein the glass would be fitted. Glass is ideal for certain pragmatic reasons as well. It can offer you unobstructed views of the immediate surroundings. Imagine a deck or balcony with a wooden railing and imagine having transparent but weather resistant glass that will facilitate lucid views of the landscape. Stainless steel and glass railings don’t have any vulnerability to weather extremes. They can resist moisture, cold and heat. There are laminated glasses that are even resistant to the stormiest weather you can experience in Canada. Stainless steel and glass railings are not just fitting for outdoor installations in cottages but for the indoor stairways as well.